Just yesterday, I entered the University of Kara here in Kara, Togo, a small country of 6.7 million people, a bit larger than my home state of Indiana, with a population 6,537,334 (minus one when I am out wandering the planet). I went to the “American Corner,” then browsed around and poked my head in. And then Oliver from the library walked me to Mr. Amodou. Hmm, I needed to be quick on my feet. There is an unfortunate misunderstanding about the USA, and often people in other countries believe we know everyone. Yes, everyone in the USA. But with a few questions, I was able to sort it out without a cultural fuss. I learned that Brenda was coming around the November 18, 2013. As I understand, Brenda Soya, the POA (public affairs officer?) 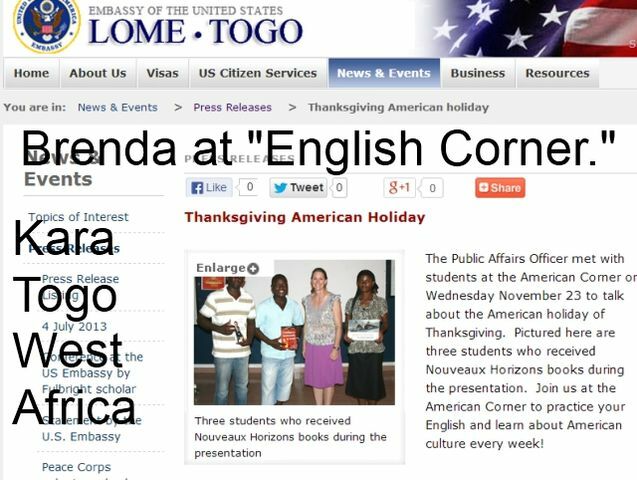 for the United States Embassy in Lome, Togo, is going to leave Togo, so she will be making a goodbye visit to the University of Kara. Along the way, they took me to Mr. Amin, who manages the American Corner, and we sat around and discussed the room and how it functions. As, I understand, on Tuesday, around 2 p.m., they have American films in English, then afterward they discuss them in English. Then on Wednesday at 2 p.m., they have an open conversation in the American Corner room. On another day, in French, they have a Toastmasters meeting. I will stop there. I now have email addresses, contacts and an overwhelming amount of information. And why? Simple: I am from America, I speak English, and I was willing to stick my nose into the room called the American Corner at University of Kara. And, if I pursued it, it could be possible to meet Brenda Soya when she comes to Kara to say goodbye to the American Corner students and staff. What does this all mean to you, a person who wants to volunteer? Many times, English students want to practice, to just talk with a native speaker. Come and volunteer in Kara, Togo. For sure, I have no clear understanding how to do this formally. However, I am 100 percent sure that the people of Kara, Togo, want to speak English with you, and if not, then try French, Kabye or Cotocoli, or just smile a lot. PS: It was a good day in Togo. An excellent day, indeed. I hope you have fun volunteering. I know you will enjoy meeting new people. Great stuff Andy, I found myself voluntarily teaching English in Chad a couple of years ago and don't think I will ever have another experience where students were so willing and desperate to learn, and so thankful I was there. Best of luck and good for you! That is awesome. I used to speak English to Koreans and Japanese twice weekly when I lived in those countries. Established real bonds of friendship. The best part was when they took us out for dinner afterwards. It was always delicious and a great way to meet the locals. Good deal!! !